Teenagers are vulnerable to a wide range of injuries that result from their active lifestyles. Participating in athletic sports and physically demanding hobbies are some of the ways that injuries related to wear and tear can arise. Muscle strains, bone fractures, and overuse injuries are issues that today’s teenagers often face. Developing bodies must be protected against damage that could lead to lasting pain or loss of function. Special Considerations for Teenagers There are many injuries commonly seen in teenagers. These include inflammatory issues such as tendonitis and bursitis as well as an impingement of the shoulders, hips, or ankles. 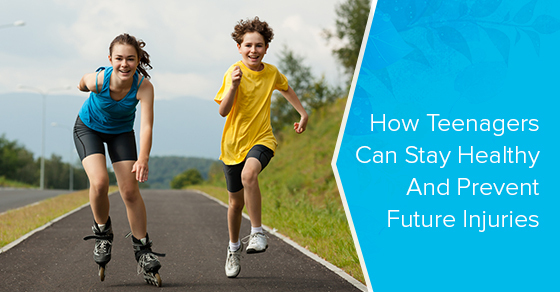 Plantar fasciitis, labral tears, patellofemoral pain syndrome, spondylolysis, stress fractures, and hypermobility issues can also arise in teenagers and young adults. Left untreated, these problems can become worse and lead to secondary issues that may require extensive and costly treatments. Working with a physiotherapist helps teenagers prevent unwanted injuries through the use of exercises, stretches, and joint mobilizations. In addition, lifestyle factors can also support their long-term health and wellbeing. The following are 4 things you should encourage your teen to do to keep their body healthy. Exercise Regularly Exercise provides many benefits to the muscles, bones, heart, and lungs. It’s been shown to improve energy levels and elevate mood. Teenagers who exercise on a regular basis have better sleep and are better able to respond to the demands that are placed on them each day. Physiotherapists can prescribe the right exercises, frequency, and intensity levels to support the health of your teenager. Include Strength Training in Their Exercise Program There are many misconceptions around the use of strength training among teenagers. Although the bones and joints are still developing, strength training can be used to safely improve and maintain muscle tone and strength. Strength training must be performed using the correct form and intensity levels. A skilled physiotherapist understands the unique needs of teenagers and can prescribe the appropriate program to provide the best results. Maintain Flexibility Stretching is critical to preventing injuries among teenagers and adults. Maintaining normal range of motion in the joints prevents muscle strains while reducing undue stress on the joints and their connective tissues. Although many people overlook the importance of flexibility, incorporating stretching in your teen’s exercise program will go a long way in keeping them healthy and injury-free. Aerobic Exercise and Cardiovascular Health Not only does aerobic exercise such as running, cycling, and swimming improve the health of your teen’s cardiovascular system, it can also provide relief from chronic pain. Improving cardiovascular health improves daily function while preventing physical fatigue. Research has also shown that aerobic exercise can enhance sleep and improve a person’s sense of wellness. These are 4 things parents should encourage teens to do to keep their bodies healthy. Understanding the importance of exercise along with strength, flexibility, and cardiovascular training is a long-term investment in their health. Working with the right physiotherapist ensures that teenagers have the right exercise plans to meet their needs, keep them safe from injury, and maintain lasting health.